Starting your first job is different from the full-time internship. The idea of sticking with the company for a really long time and the way your bosses and colleagues will treat you is totally different from the treatment received during an internship. Also, the first job out of college is memorable experience be it good or bad. It is your first job that decides the course of your action for a long haul; it is the entry in the professional world. Many freshers when starting out in the first job experience the difficulty to transcend from college life into the real world. If not paying attention to the behavior and attitude, might give a bad impression about you in the office. Therefore, it is important to know how to behave and work in your first job, as it helps gain experience required for future jobs. Paying attention to your first job will give you a clearer insight of what you want to do rest of your lives. Therefore, to build a better career job, first job is needed to be taken seriously. As a fresher in the industry, the first thing that you need to learn is hard work which is important for future growth. Many freshers when entering the industry tends to take everything for granted, but the sooner one learns the benefits of the hard work, they can reap the results earlier and better. Sometimes your work might make to stay late, don’t hesitate to do that, it is beneficial to prove yourself to your managers and bosses and to be noticed. Hence, hard work is an important step to keep in mind to achieve the best results. As a fresher, you cannot expect to live in a fantasy world, professional life is the real world, where the competition is high and to maintain a certain position people have to work beyond their comfort zone to maintain it. Take breaks and do have fun in between, but do not underestimate your work, your work is no joke and it should be taken seriously. Even it is your first job, putting your effort in your first job will pay you ahead. Work is a habit, from paying attention to detail, punctuality, and other aspects, it is important to develop the habit of hard work in your initial days because years later you will thank the time working without excuses. If your office follows a certain dress code, then it is important to follow it with discipline. Avoid wearing casuals when everyone in your office is following the dress code, being dressed as per the company is a way you create an impression on your colleagues and they take you seriously. Dress code policy allows you to be taken seriously in your office. By following dress code it shows that you are a representative of your organization in the outer world. In your first job learn as much as you can. It is an opportunity where you get to explore various job roles in an organization and can see if you find something interesting for yourself to fit in. Also, try learning on the job how sales department functions, how marketing and operations fit into the picture. Talk to the managers on various roles, ask questions and learn new things. As a fresher, everyone will readily help you and guide you and this is the opportunity that comes the best, once you become a seasoned professional learning something new will not be easy. Not everyone gets an opportunity or luck to get high salary package in their first job. Rather than taking it as something negative, it is better to think another way round. Use your skills and talents in learning and gaining knowledge. During initial phases of professional life, money needs to take the backseat and what counts important is the experience and knowledge of the work you do. Learning the functions of various departments will make you efficient as problem-solving during your professional life and you will be delivering the better results. If you get an opportunity to work with the founder or CEO of the company then never let this benefit leave from your hands and try learning as much as you can. Joining an organization is joining a whole new team of people with different nature and knowledge. Organizations are all about people who work with team, where everyone works with each other, being part of a team is an important aspect of any job. Always work with your co-workers, know where in the process you fit in and who all are the people you need to coordinate with. When working with people, always be patient because there could be times, where the work gets delayed from their end which may hamper your process, in such situations try talking to them and learn about the causes, see if you can help them. Behave as a person of a strong team because a good team ensures success to everyone. Everyone loves and appreciate people who are upbeat happy and positive. Because energetic people bring energy to the office, they are the one who motivates others. Therefore, in your work atmosphere, a good and positive attitude matters a lot. Create your impression for which people would like to remember you for, keeping the right attitude will get your job done far more easily. Prevent any kind of negativity to let inside you. The best way is to keep your personal and professional separate; if you have any concerns from your personal life then it is better to leave it at your home. Lunch breaks and coffee breaks are not just meant to be treated as breaks. The value of these breaks increases tremendously and make sure that use them wisely. Use it as a source to network with other colleagues and teammates; it is a casual form of meeting more and more people. Try using these lunch breaks wisely instead of just randomly chatting with people. Ensure that you carry the right image and leave a great first impression on others. In your first job, it is not necessary that you will get to figure out of what you will be doing for the rest of your life. There are very few who can figure it out from their first job about their career goals. The first job is generally you’re A/B testing of your career path, experiment with the various kind of work in your office. Ask your senior colleagues and managers about the various future prospects of your job. See if you need to take additional degree after some time to gain more traction in your career. 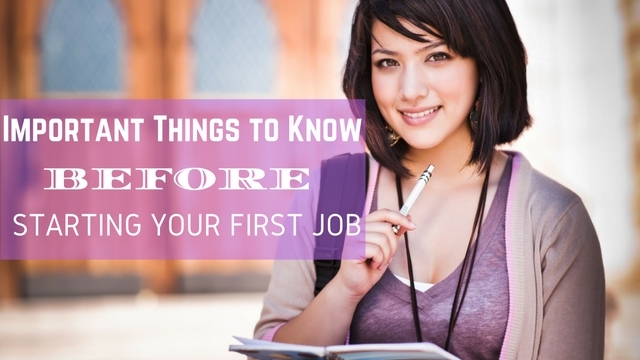 The first job is a good start to gain maximum exposure and knowledge to pave a strong career path. While in your first job, it is good to build your value, become reliable to your employer and your work should be so good that no one can do it. There are lots of people in the organization who look for opportunities to escape work or simply push papers around, but it is good that you step up and be sincere towards your work. People should respect you for who you are and they should look up to you during the time of crisis. It does not matter whether you are a fresher or a seasoned employee, being of value to your company always helps. It is not only meant to build your reputation, but it is also good during the times when your company might be facing trouble. As a fresher, it is important to interact with people within the organization. Interaction is essential as it helps you to create your impression, allows you to learn more and it helps you to build your network. Networking is very important because if you are having trouble to get a job done then you will know whom you need to talk to find the solution. Even when you are looking for a job opportunity, thank people that you stayed in touch in your first job, they will be the right resource for finding jobs more appropriate for you. But networking is more about keeping in touch with people on regular basis. Send them e-cards on every occasion, call them once in a while, these tiny gestures will strengthen your network. As a fresher, you might not be completely aware of how to tackle a problem if when arised. If in case you see that a certain job or job skills requires special attention or responsibility, it is good to move out of your comfort zone and volunteer for it. The chances are high that you might not have complete information about the work or an issue, but it will be an effort to bring the attention of the senior management on you. Another factor is that you will get an opportunity where you get to interact closer to your bosses and will get to learn the better tricks of the trade. But always keep in mind; during volunteering for the job ensure that you have the strength and responsibility to deliver the best results. As a fresher, paying attention becomes important to present your seriousness for the job. Listen to the instructions your manager is giving to you, pay attention to the information they are asking or if they are questioning you. Being attentive in the office is good as then the managers tend to take you seriously regarding work. If you are attending the meeting, ensure that you listen to the discussion and do not forget to give your input also. Remembering everything is not easy so always carry a diary and a pen during the meeting. Write down the important points discussed and work on the task assigned to you. Attentiveness is an essential key to achieving success in future. Success takes a lot of time and to achieve it requires a lot of patience. In your first job prevent from rushing into anything. Stick to your first job for at least a year and learn as much as you can. Avoid switching too many jobs early in your life; remember all jobs require the lot of effort, patience, and work. If you tend to face the problem rather than running from it, face it and find the appropriate solution. If you are not able to cope up with the situation, then it is good to take career advice from your seniors, counsel from your colleagues. Asking for help and career guidance is good and many a times people help each other readily. Finding the right first job is a dream come true for many. If you are one of those lucky people who get to find the right first job then make sure that you make the most of it and learn as much as you can. Ask for guidance from your seniors; ask questions and work to prove your capability. Or if you are one of those who has a hard time settling the first career or job and you face various issues in your office. Your boss or manager might not be supportive or you find it difficult to ask questions, then try not giving up on your first job. This is also a form of benefit for you, where it is a challenge how to handle situations when things are not favorable. Whatever the case maybe, first jobs are a good place to experiment, explore, make new connections, and to learn. Ensure that you leave a right and lasting impression in your first job as this will beneficial for long term.